A Chicago artist continues to make an impression on the city more than 25 years after he died. You may not know his name but you’ve likely seen his public art. Egon Weiner was also a teacher, and his prominent students continue his legacy. On the near South Side, bronze flames rise in front of the Chicago Fire Academy. Called “Pillar of Fire,” it marks the origin of the Great Chicago Fire of 1871. The 30-foot tall abstract sculpture was dedicated in 1961. At the corner of Diversey and Sheridan, another public sculpture is made in a more representational style. It honors brotherhood in all its diversity. These contrasting works are both the creations of Egon Weiner, an artist who escaped war-torn Europe and found a new life in Chicago. A rare exhibition of Egon Weiner’s works is on display at Oakton Community College in Des Plaines. Egon Weiner came to Chicago from Austria when his home country was annexed by Nazi Germany. “He was in some kind of dilemma because his mother was Catholic but his father was Jewish and that made him vulnerable in Vienna in 1938,” Harpaz said. He fled Austria, but his parents and brother did not survive the war. In Chicago, the 30-year-old focused on continuing his art career. View a slideshow of Weiner’s work. Images are courtesy of the Koehnline Museum of Art. Egon Weiner was an influential professor at the School of the Art Institute for 26 years. He saw one of his star students of the 1950s rise to prominence. Chicagoan Richard Hunt is a sculptor of international reputation. 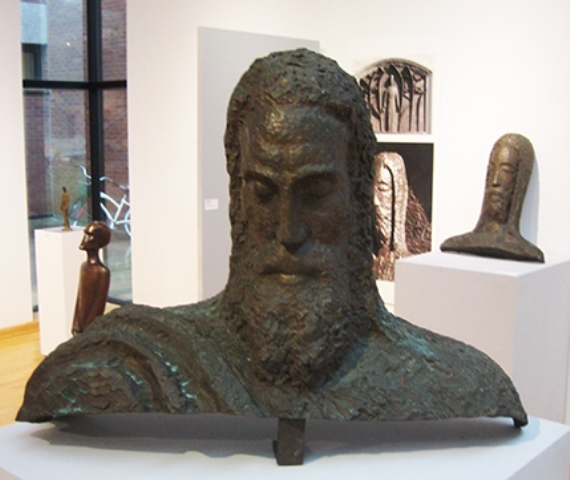 While teaching, Egon Weiner took commissions for public and private works, like the bronze statue of Jesus Christ on the campus of North Park College. Despite his tragic family history, he was admired by students for his optimism and drive. "Maybe there’s a sense that some people like him and of his generation come to America, and they felt they had to do something for themselves, and something that reflected on their family, their tradition,” Hunt said. “And in a way it was kind of an homage to those relatives and friends who died and didn’t make it." Weiner also kept tabs on former students – and he let them know what he thought of their work. “Once a teacher, always a teacher, even though I felt I was grown, if he saw something he thought could be improved he let me know,” Hunt said. The show at Oakton Community College includes works from the Weiner family estate that haven’t been seen in years. There’s a smaller version of “Pillar of Fire” made by the artist. The exhibition is called “Pillar of Human Emotions” because Egon Weiner often spoke of the importance of emotions in art. The exhibit runs through Friday, Sept. 19, at the Koehnline Museum of Art at Oakton Community College’s Des Plaines campus. The museum is open 10:00 am-7:00 pm Monday through Thursday through August. Beginning in September, the museum is open 10:00 am-6:00 pm Monday through Friday, and 11:00 am-4:00 pm on Saturday.